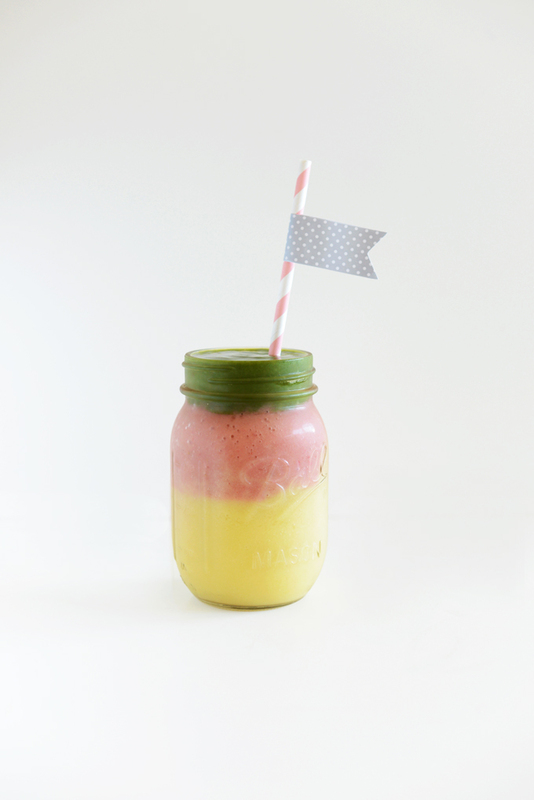 The inspiration for this smoothie is none other than my favorite fruit at the moment: MANGO. The base is frozen mango – I bought mine fresh, chopped them up and froze them – then with each layer you introduce a new flavor. In this case it’s strawberry and spinach. But overall, the mango is the dominant flavor. Hooray! Also, hooray for super cute straws I found at Target (while not shopping for straws – whoops)! Hooray! 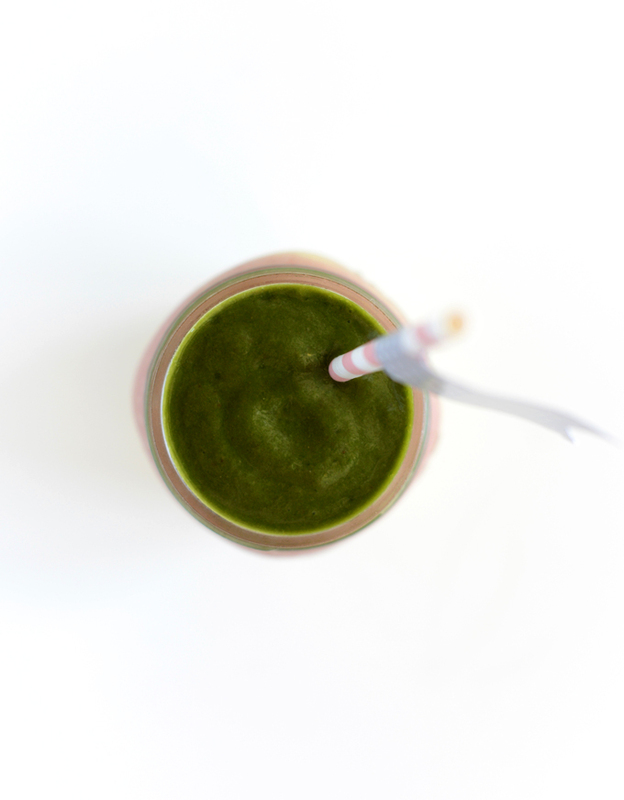 As to how you get that layered effect, simply blend your mango base and pour half in the glass; then add strawberries, blend and pour it on top, and lastly add a handful of spinach, blend and pour it on top. BOOM. Yellow, red, green! Stoplight smoothie for the win. Breakfast? Yes. Lunch? Yes. Snack? Totally. Go wild friends. Go wild with breakfast again. I give you permission. 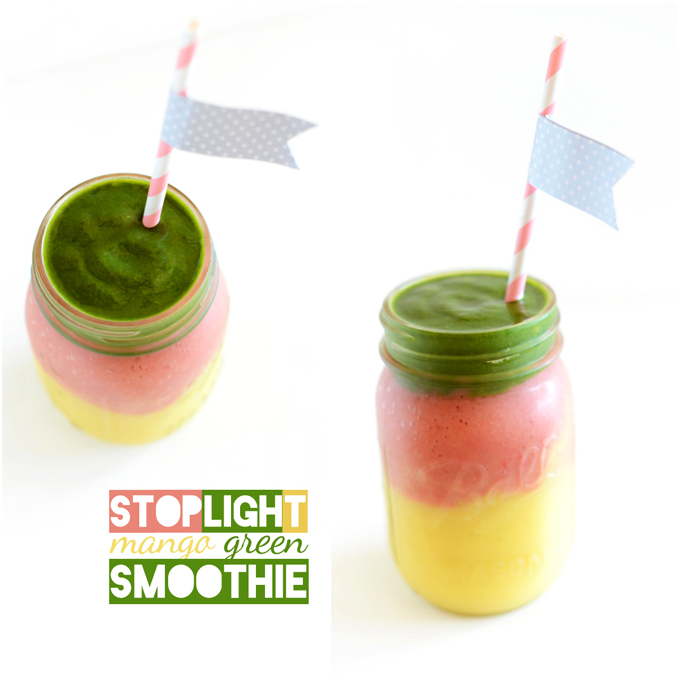 A layered multi-colored smoothie with frozen mango, strawberry, and spinach! The perfect healthy breakfast, snack, or dessert. Place mango into a blender with milk or water and blend until smooth, adding more mango to thicken and more water or milk to thin. 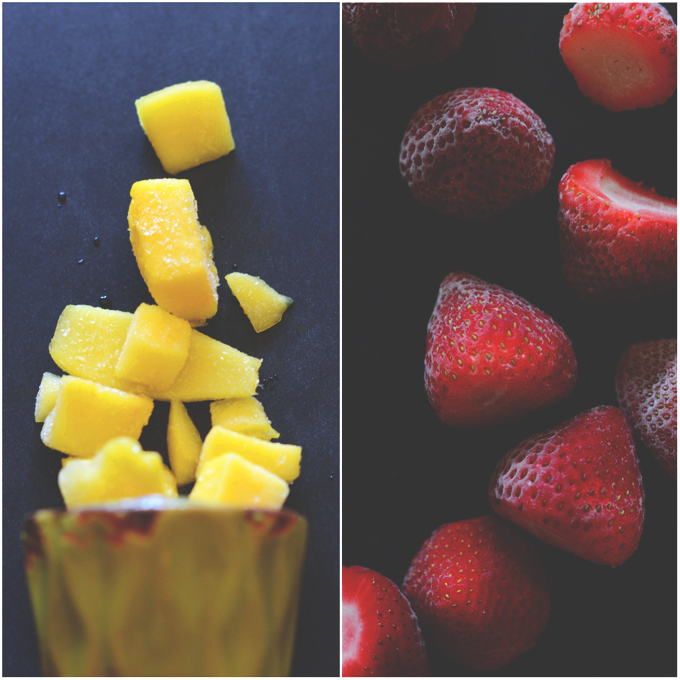 Pour 2/3 of the smoothie into a serving container and then add strawberries to the blender. Blend until smooth, adding a bit more water or almond milk if needed. Taste to see if it needs to be sweetened. I added 1/2 a small frozen banana at this point. Pour 3/4 of the smoothie into the serving glass on top of the mango layer. Lastly, add spinach to the blender and blend until smooth. Pour into the serving glass, making three distinct layers. Sip and enjoy, or freeze for later. *Nutrition information is a rough estimate calculated without sweetener. My three year old is not a big smoothie fan, no matter the flavours. This smoothie however is such an aesthetically pleasing experience for tongue and eyes, she drank it right down :) I called it a rainbow smoothie. Its soooo nice to make something that is so simple and so beautiful to look at. This is so gorgeous!!! I love a gorgeous smoothie. 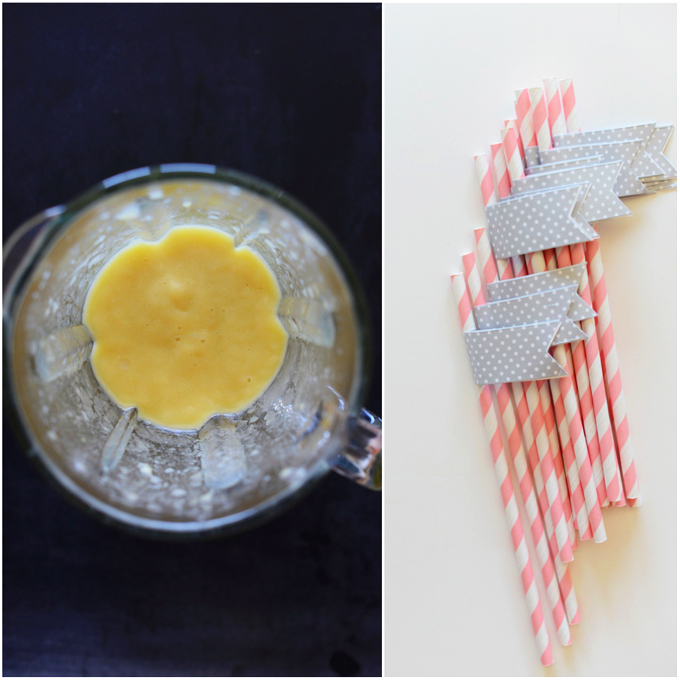 Love this smoothie – so adorable! Really REALLY love your blog! Great photos always! Just a quick question, I made a green smoothie yesterday that had a layered thing going on, only the layers wouldn’t happen, it all just blended to unattractive murkiness…Perhaps this is because my smoothie wasn’t freezing cold? Any ideas why that happened? Danielle, this has happened to me before, too! The trick is keeping the smoothie as thick as possible at all stages of blending. Otherwise if any one of the layers is too thin, it’ll all meld together! Hope that helps. are the nutritional stats using half and half or water? My guess is she used 1/2 cup water & 1/2 cup almond milk. Omg!! How amazing :) I can’t wait to try this!! Great job!! every thing about this post is telling me to go make this now and swim in this smoothie. Love that layered look! So fly! What a great idea! It looks so cute, and sounds pretty tasty. I love those straws too – Target is a dangerous(ly fun) place! This is so fun! And I bet it’d be a great way to sneak some healthy ingredients into kids haha and yes, target is oh-such a dangerous place! Oh, what a cool idea! Love the colours of this – it’s almost too pretty to eat! There is some really nice looking food just not this good. So cool! I Love this idea and it sounds delicious! Jess said it best – one can never be trusted at Target. You walk in intending to spend $5 on this, and come out with $75 of this and lots of that. This is so fun, Dana – love all those layers and flavors! I swear that things in Target just jump off the shelves and into my waiting shopping cart. You definitely can’t be held responsible.